It’s finally here. Apple has finally answered the prayers of MobileMe customers by releasing iDisk for MobileMe. 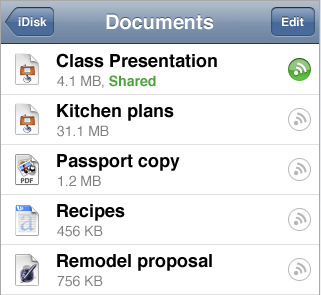 MobileMe iDisk lets you view and share your iDisk content right from your iPhone or iPod Touch. The app allows you to go through your folders and share them easily (by tapping on the share icon). You can also access your recently viewed files and even view PDF, iWork, and Office files. Using the app is very easy. All you have to do is provide the app with your username and password, you are all set. After you successfully log in, you can go through public folders, view your documents, and share some of them with your friends. You can also set passwords for your content to protect your sensitive information. And if you are not a MobileMe member, you can always try Apple’s 60 day trial plan to find out what you are missing. Overall, if you are a happy MobileMe member, you are going to enjoy using iDisk. It’s easy to use, comes with a somewhat intuitive interface, and is free.